Article was written by Aimee Hicks with contributions from Saloni and Babar. Article edited by DJRiter. On a daily basis, the news is ablaze with some new horror. This unfortunate fact gives television writers a whole plethora of headline-making topics to pull from. Even though the material is ripe for production it's not always easy to bring certain real-life situations to the screen in a respectful way. But in the hands of the right writers, a script worthy of doing justice to the situation at hand can be crafted. Then it's all about getting the material into the care of a skilled performer that can do justice to the material. For many seasons now, Grey's Anatomy has been building up a powerful domestic violence storyline. 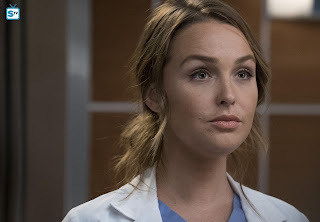 Everyone was evidently quick to realize the talent they had scored when they signed Camilla Luddington as Jo Wilson. They wasted no time entrusting this big storyline to her. It is her ability to walk a very thin line with the precision of a tightrope walker that made her perfect for this storyline. She has such immense control over her performance that she was able to keep this tense and highly emotional storyline right on balance the entire time. It is this ability that aids her in delivering such impactful performances that an audience member watching can't help but feel the emotions coursing through the character as if it was happening to them. That ability is what led her to win the title of SpoilerTV's Reader's Choice Performer of January. The episode that Luddington won for in January was 1-800-799-7233 (14x9) which is also very appropriately the number for The National Domestic Violence Hotline. With an episode title like that the expectations were already soaring high. The pressure on the performers had to be tremendous to do this story right. They were in great hands with the writers and in Camilla Luddington they couldn't have had a better lead for this storyline. She acted with immense grace, charisma, and an indescribable amount of courage throughout. She used every part of her body to convey what was going on and she did it with incredible talent. From wild eyes full of conflicting emotions to a tense body coiled to pounce, she used her body every bit as powerfully as she used the scripted words. The best performers know how to find the beats between the words to act on in order to elevate a moment and Luddington most certainly falls into this category. She is one of the special elite that know how to go beyond the words to create a truly special performance. Ever since it was revealed that Jo has a husband she ran away from, none of the details of their relationship have been discussed, but when talking to Jenny (Bethany Joy Lenz), Jo opens about the terrible times she had with Paul (Matthew Morrison). In this scene, Luddington takes her character back to a dark time in her past. And in showing another portion of the great strength of the character, she relives the memories that still haunt her because she is worried that another woman, Jenny, is going through the same situation by being involved with the same man. Luddington brings a depth of emotion to the scene through the delivery of her dialogue, but even more so conveys the story of the trauma she endured through her facial expressions and soulful looks in her eyes. It was those subtle touches and nuances from Luddington that created such great empathy and remorse from the viewers that she had to go through all this. And now she is having to relive every painful moment. In a short scene but extremely meaningful scene she literally had just a few seconds to show Jo breaking down after coming face to face with her abusive ex. All, her reactions were poignant and real, in an incredibly trying moment for Jo. Everyone around her is praising Paul, her ex, and she had to stand there and listen and say nothing, she had to remain professional. It was clearly evident she was fighting to make a decision as to how to react. Did she lash out, release all the anger she'd built up over the years or did she remain calm and professional? The sheer amount of acting prowess that it took for Luddington to pull off all these non-verbal emotional transitions is astounding. She chose to portray Jo as brave through it all, while also showing her true feelings emerge in a brief bit of dialogue, "he lies." She's choosing to believe her friends and co-workers will believe her about this man. Jo immediately turns to Alex (Justin Chambers) and Meredith (Ellen Pompeo), both of whom believed her and stuck by her. Her faith in her friends is restored. Especially in this season, Luddington has shown great chemistry with Ellen Pompeo, and it played out to great results here. When working with a strong scene partner, like Pompeo, a performer can feel freer to let go and lose themselves in a performance. This is exactly what Luddington does in the gallery scene and although it's a short scene, she does a masterful job of displaying a range of emotions: stress and anxiety but also relief that she was with two people close to her and possibly getting a divorce. 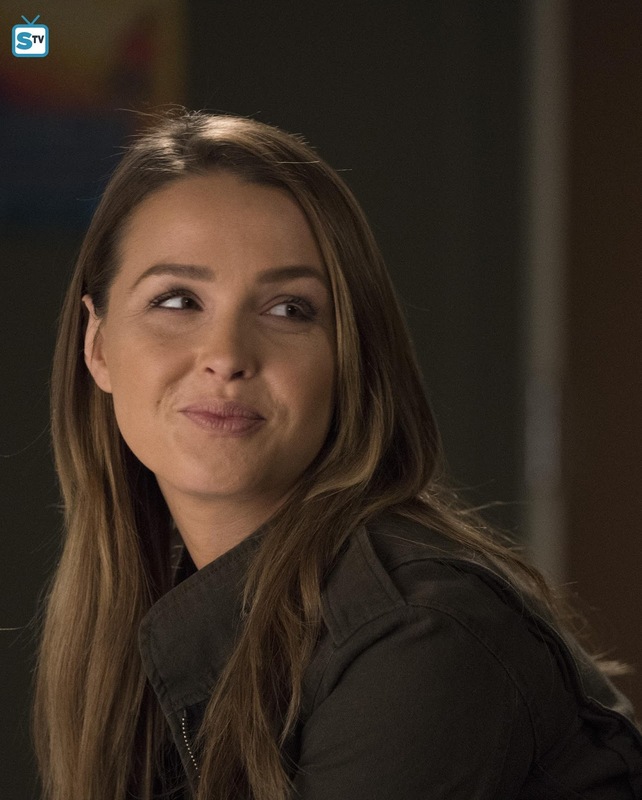 Later, when Paul confronts Jo about "lying" to Jenny, Luddington delivered one of her very best moments of the episode. That is a big thing to declare given how much she had to convey throughout this hour, but it stands true. Luddington portrayed so many different facets of Jo in this single scene. She brought to life thoughtful Jo who tried to protect Jenny as well as fearful Jo and steadfast Jo. Luddington's performance made it abundantly clear how much Paul had hurt her during their marriage. She is a strong, thoughtful, and brilliant woman yet he still brings out a primal fear from deep inside of her that she can only just barely keep at bay. As Paul was going off on Jo there were these little ticks and movements that Luddington perfectly timed that showed the silent struggle raging within the character. Luddington allowed Jo to be rightfully fearful of the unhinged and torturous Paul, but she also showed Jo standing firm and holding her ground for as long as she could. The flinch when Paul raised his hand towards her was so heartbreakingly telling. It showed that he had made that same gesture towards her many times before and it seemingly always ended badly for her. This storyline wasn't about weakness, but incredible strength in the shadow of the embodiment of evil, and Luddington beautifully captured that. As that scene ended Paul declared he was holding onto Jo's card so that he could find her. That was when Jo's dam finally cracked and fear consumed her at that terrifying realization. Luddington acted much of this scene without saying a word and yet what she did with her eyes and body told Jo's entire side of the confrontation. The deep breaths she had to take to recompose herself were quite telling as well. Jo might be fearful but she wasn't going to give Paul the satisfaction of seeing it. This entire exchange was so important because it captures with stunning realism what real life abuse victims have to endure and overcome. The way Luddington captured every little moment showed how much work she put into researching abuse victims. She did justice to all the brave souls that have endured and survived the real-life version of what Jo went through with Paul. The episode ended with two poignant moments that again showed that no matter how small a scene is Luddington still has a big presence. After the big confrontation with Paul over the divorce papers Jo laments that now that Paul knows where she is she wishes he was dead. The acting by Luddington was right on par with the incredible performance she delivered throughout. The scene was a short one, but the fear in her eyes and the exhausted posture she was carrying said so much before she even began to speak. Luddington knows how to use her body to add an extra punch to a performance and she does it so well. She used subtle but powerful movements, like when she quickly moves her hands off the table when he comes closer and of course when he's about to leave and Jo tells him he's a monster. Her dialogue delivery was impactful as she enunciated each line with depth, her voice was shaky and full of emotion. Jo was fighting so hard to not lose her composure, but she was just done with it all. What was impressive is that despite everything that was happening Jo still felt like a strong woman who was digging deep to keep fighting on. When she fired back that she didn't want to have to be protected there was a fierceness mixed in with all the other raging and conflicting emotions she was being forced to confront. When Jo wished death on Paul it was clear how exhausted she was by everything. Luddington perfectly captured that moment just past exhaustion when a person is so emotionally spent they have nothing left to give. She made it clear that Jo wasn't defeated, but that she needed a moment to process everything. It was a very real moment captured in a stunningly honest and real way. This powerful hour then closed out on this storyline with Paul being treated for injuries sustained in an accident. Luddington is only in this scene for a flash and didn't speak a single word yet she told a whole story with just her body. In the prior scene, it was evident how emotionally spent Jo was by everything. In this scene, Jo seemed to be oddly at peace. It was quite obvious though that she was a bit shocked. Her look of contentment made one think she had done the deed, but the somewhat shocked look on her face brought that into question. All of that was conveyed without a single word being spoken. That was a perfect example of how far Luddington's range spans. The writers can give her anything and she will find a way to expand on the material in brilliant ways that even the writers might not have expected. That is a hallmark of broad range exceptional talent. 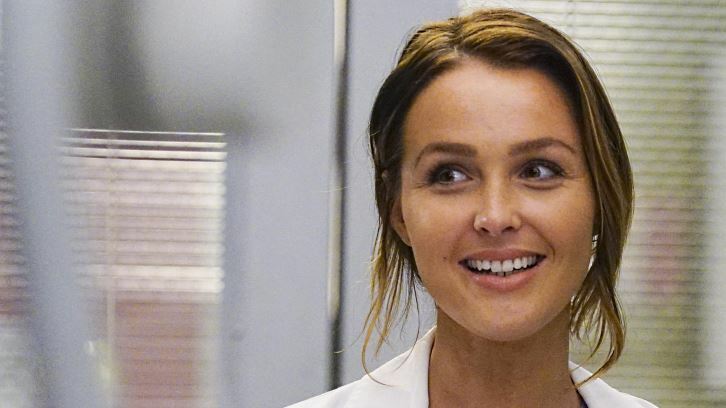 Time and time again throughout 1-800-799-733 Camilla Luddington proved why she was worthy of being chosen SpoilerTV's January Reader's Choice Performer of the Month. Her amazing performances are consistently impactful and noteworthy. She is a true talent who cares about her fans and takes great pride in doing justice to the stories she is tasked with telling. Her talent knows no bounds and with her portraying Jo Wilson the writers can do just about anything with the character and Luddington will rise to the occasion. This was a showcase episode for Jo Wilson and it was a tour de force performance for Camilla Luddington. She was the focus of the episode and therefore had a lot of major moments throughout. This article couldn't cover them all, so please feel free to use the comments to talk about all of her other scenes in this episode. Feel free to discuss her performances from other episodes as well.